Dusty and Me, the 1970s-set tale of one young man and his adopted dog, was filmed in Goole and Bubwith. 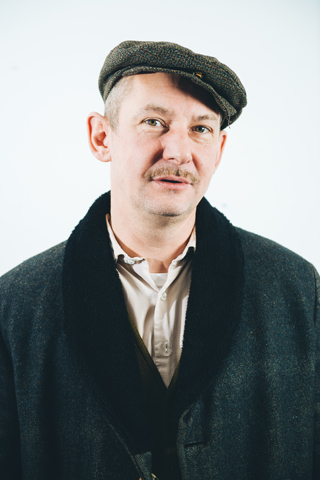 Roger Crow visited the set and spoke to director Betsan Morris Evans and star Ian Hart (pictured above). Betsan, what attracted you to the movie? I love the story. I love the fact it was a picture set in the north, and not in a ‘it’s grim up north’-type way. It has a fairytale element, so it sort of has that Amelie-style feel to it. Tell us about the look and tone of the project. We went with really heightened colours. We wanted to do something very distinctive. And yet the heart of it… it’s just a very strong story about a family. There’s no car chases. Nothing desperately exciting happens. And it’s about a dog and a boy, and through the dog, the boy reconnects with his family. Dislocation with families is very big at the moment. In the 1970s they used to take children from working class backgrounds and send the great and the good to public schools, which made them not settle at home. And not belong at school either. So it was an interesting social experiment. This looks at that, and through this dog he gets back with his family. And not only do his family relate with him again, they also begin to relate to each other. So we’ve got resolutions of lots of relationships. Have you worked with any of the cast before? No, and we had a very short run-up (to filming). So we were in the situation of four weeks before starting (filming), trying to find a cast. And the actors fell in love with the script. They all said ’Yes’. Which was exciting. We’ve had to work around Iain Glen; he’s arrived from Game of Thrones, from Madrid, and then went off to Belfast. The actors made an effort. And they’ve taken the script and run with it. How difficult was it having a greyhound as your star? Really hard. It’s not like a nice Labrador that you can say ‘Sit. Lie down’. But a greyhound looks at you and goes… nothing, because they’re not interested in food, so you can’t bribe them. And they’re proper greyhounds. They race. They’re two sisters that look identical. They’re not interested in people. They’re just interested in running, when they want to run. That’s the interesting thing. It meant we had four weeks, which is short for a movie anyway, and it had dogs. It looks like it has an international appeal. I let Betsan get back to work and finally meet one of my favourite actors, Ian Hart. You may have seen him in assorted projects, including Backbeat, Harry Potter and the Philosopher’s Stone, Bates Motel and Boardwalk Empire. What persuaded you to come from sunny LA to the north of England? The weather (laughs). As always. Perpetual sunshine is just too much. The ocean, and the mountains, the humming birds. I don’t know, it seemed like the right thing to do. When I met Betsan and I read the script… it’s such a nice, light-hearted piece. There’s a lot of drama that is based in misery. I was recently a judge at a film festival and the theme may as well have been misery. Every now and again it’s nice to leave that world behind and do something which is a little bit more light-hearted. And I seldom do that, so for me it was a good opportunity. You’ve appeared in so many great projects. What’s been your favourite? I did this thing called Five Daughters, and that’s a piece of work I’m quite proud of. I really enjoyed Boardwalk Empire; I was so glad to do that. I did a little bit on a pilot for Martin Scorsese; I always wanted to work with him. Sadly it was so brief. I played Led Zeppelin’s manager, Peter Grant. I got to meet Scorsese, only for a few days but nonetheless it was such a thrill. I wouldn’t say was the best performance I’ve ever given, but it was a nice experience. As a Marvel fan, it was good to see you in Agents of Shield. Yeah, the anomalous things you do when you need the rent money. When I was living in LA, my rent was huge. It was the nature of the school district. I’ve got two kids so I had to live in the school district that was applicable. And with that, like everything else comes a massive rent bill. I did Agents of Shield. That paid that month’s rent. You go in and you do two of three days or whatever it was. The people are lovely, so I’ve no regrets.